These highlights do not include all the information needed to use REBIF safely and effectively. See full prescribing information for REBIF. Thrombotic Microangiopathy: Cases of thrombotic microangiopathy have been reported. Discontinue REBIF if clinical symptoms and laboratory findings consistent with TMA occur (5.6). REBIF (interferon beta-1a) is indicated for the treatment of patients with relapsing forms of multiple sclerosis to decrease the frequency of clinical exacerbations and delay the accumulation of physical disability. The recommended dose of REBIF is either 22 mcg or 44 mcg injected subcutaneously three times per week. REBIF should be administered, if possible, at the same time (preferably in the late afternoon or evening) on the same three days (e.g., Monday, Wednesday, and Friday) at least 48 hours apart each week. Generally, patients should be started at 20% of the prescribed dose three times per week and increased over a 4-week period to the targeted dose, either 22 mcg three times per week (see Table 1) or 44 mcg three times per week (see Table 2). Patients prescribed a targeted dose of 22 mcg three times per week should use the prefilled syringes for titration. A Titration Pack containing 6 doses of 8.8 mcg (0.2 mL) and 6 doses of 22 mcg (0.5 mL) is available for use during the titration period in both REBIF prefilled syringes and REBIF Rebidose autoinjectors. Decreased peripheral blood counts or elevated liver function tests may necessitate dose reduction or discontinuation of REBIF administration until toxicity is resolved [see Warnings and Precautions (5.2, 5.5) and Adverse Reactions (6)]. REBIF is intended for use under the guidance and supervision of a physician. It is recommended that physicians or qualified medical personnel train patients in the proper technique for self-administering subcutaneous injections using the prefilled syringe or injection device approved for use with REBIF. Injection depth of the REBIF Rebidose autoinjector is fixed at 8 mm; the health care provider should determine the injection technique. The initial injection should be performed under the supervision of an appropriately qualified health care provider. Appropriate instruction for self-injection or injection by another person should be provided to the patient or their caregiver, including careful review of the REBIF Medication Guide and the REBIF Rebidose autoinjector Instructions for Use that accompanies the product. Users should demonstrate competency in all aspects of the injection prior to independent use. If a patient is to self-administer REBIF, the physical and cognitive ability of that patient to self-administer and properly dispose of prefilled syringes or the REBIF Rebidose autoinjectors should be assessed. Patients with severe neurological deficits should not self-administer injections without assistance from a trained caregiver. Concurrent use of analgesics and/or antipyretics may help ameliorate flu-like symptoms associated with REBIF use on treatment days. REBIF (interferon beta-1a) should be used with caution in patients with depression, a condition that is common in people with multiple sclerosis. Depression, suicidal ideation, and suicide attempts have been reported to occur with increased frequency in patients receiving interferon compounds, including REBIF. In addition, there have been postmarketing reports of suicide in patients treated with REBIF. Patients should be advised to report immediately any symptoms of depression and/or suicidal ideation to the prescribing physician. If a patient develops depression, cessation of treatment with REBIF should be considered. Severe liver injury, including some cases of hepatic failure requiring liver transplantation, has been reported rarely in patients taking REBIF. Symptoms of liver dysfunction began from one to six months following the initiation of REBIF. If jaundice or other symptoms of liver dysfunction appear, treatment with REBIF should be discontinued immediately due to the potential for rapid progression to liver failure. Asymptomatic elevation of hepatic transaminases (particularly SGPT) is common with interferon therapy [see Adverse Reactions (6.1)]. REBIF should be initiated with caution in patients with active liver disease, alcohol abuse, increased serum SGPT (> 2.5 times ULN), or a history of significant liver disease. Also, the potential risk of REBIF used in combination with known hepatotoxic products should be considered prior to REBIF administration, or when adding new agents to the regimen of patients already on REBIF. Reduction of REBIF dose should be considered if SGPT rises above 5 times the upper limit of normal. The dose may be gradually re-escalated when enzyme levels have normalized [see Warnings and Precautions (5.8); and Dosage and Administration (2.1)]. Anaphylaxis has been reported as a rare complication of REBIF use. Other allergic reactions have included skin rash and urticaria, and have ranged from mild to severe without a clear relationship to dose or duration of exposure. Several allergic reactions, some severe, have occurred after prolonged use. Discontinue REBIF if anaphylaxis occurs. In controlled clinical trials, injection site reactions occurred more frequently in REBIF-treated patients (92% in the 44 mcg group and 89% in the 22 mcg group) than in placebo-treated patients (39%) and at a higher frequency in REBIF treated patients (83%) than in AVONEX-treated patients (28%). Injection site necrosis also occurred more frequently in REBIF-treated patients (3% in the 44 mcg group and 1% in the 22 mcg group) than in placebo-treated patients (0) during the two years of therapy. All events resolved with conservative management. Injection site reactions including injection site pain, erythema, edema, cellulitis, abscess, and necrosis have been reported in the postmarketing setting. Some occurred more than 2 years after initiation of REBIF. Necrosis occurred at single and at multiple injection sites. Some cases of injection site necrosis required treatment with intravenous antibiotics and surgical intervention (debridement and skin grafting). Patient understanding and use of aseptic self-injection techniques and procedures should be periodically evaluated, particularly if injection site necrosis has occurred. Patients should be advised of the importance of rotating sites of injection with each dose and not reusing syringes. Patients should be advised against injecting an area which is inflamed, edematous, erythematous, ecchymotic, or has any other signs of infection. These signs should be reported to a healthcare professional immediately. Decreased peripheral blood counts in all cell lines, including pancytopenia, have been reported in REBIF-treated patients. In controlled clinical trials, leukopenia occurred at a higher frequency in REBIF-treated patients (36% in 44 mcg group and 28% in 22 mcg group) than in placebo-treated patients (14%) and at a higher frequency in REBIF-treated patients (6%) compared to the AVONEX-treated patients (<1%). Thrombocytopenia and anemia occurred more frequently in 44 mcg REBIF-treated patients (8% and 5%, respectively) than in placebo-treated patients (2% and 3%, respectively). In a pooled analysis of 7 placebo controlled trials with REBIF doses of 22 mcg or 44 mcg, the rate of pancytopenia (in subjects with normal baseline values who developed laboratory values less than the lower limit of normal for all 3 hematology parameters simultaneously) was higher in the total REBIF group (5.5 per 1000 subject-year) than in the placebo group (1.2 per 1000 subject-year). Patients should be monitored for symptoms or signs of decreased blood counts. Monitoring of complete blood and differential white blood cell counts is also recommended [see Dosage and Administration (2.1) and Warnings and Precautions (5.8)]. Cases of thrombotic microangiopathy (TMA), including thrombotic thrombocytopenic purpura and hemolytic uremic syndrome, some fatal, have been reported with interferon beta products, including REBIF. Cases have been reported several weeks to years after starting interferon beta products. Discontinue REBIF if clinical symptoms and laboratory findings consistent with TMA occur, and manage as clinically indicated. In addition to those laboratory tests normally required for monitoring patients with multiple sclerosis, blood cell counts and liver function tests are recommended at regular intervals (1, 3, and 6 months) following introduction of REBIF therapy and then periodically thereafter in the absence of clinical symptoms. Patients with myelosuppression may require more intensive monitoring of complete blood cell counts, with differential and platelet counts [see Dosage and Administration (2.1) and Warnings and Precautions (5.5)]. New or worsening thyroid abnormalities have developed in some patients treated with REBIF. Thyroid function tests are recommended every 6 months in patients with a history of thyroid dysfunction or as clinically indicated. Because clinical trials are conducted under widely varying conditions, adverse reaction rates observed in the clinical trials of REBIF cannot be directly compared to rates in the clinical trials of other drugs and may not reflect the rates observed in practice. A total of 712 patients with relapsing-remitting multiple sclerosis (RRMS) in two controlled clinical trials took REBIF (22 mcg or 44 mcg given three times per week) [see Clinical Studies (14)]. Ages ranged from 18 to 55 years. Nearly three-fourths of the patients were female, and more than 90% were Caucasian, largely reflecting the general demographics of the population of patients with multiple sclerosis. The most commonly reported adverse reactions were injection site disorders, influenza-like symptoms (headache, fatigue, fever, rigors, chest pain, back pain, myalgia), abdominal pain, depression, elevation of liver enzymes and hematologic abnormalities. The most frequently reported adverse reactions resulting in clinical intervention (e.g., discontinuation of REBIF, adjustment in dosage, or the need for concomitant medication to treat an adverse reaction were injection site disorders, influenza-like symptoms, depression, and elevation of liver enzymes [see Warnings and Precautions (5)]. 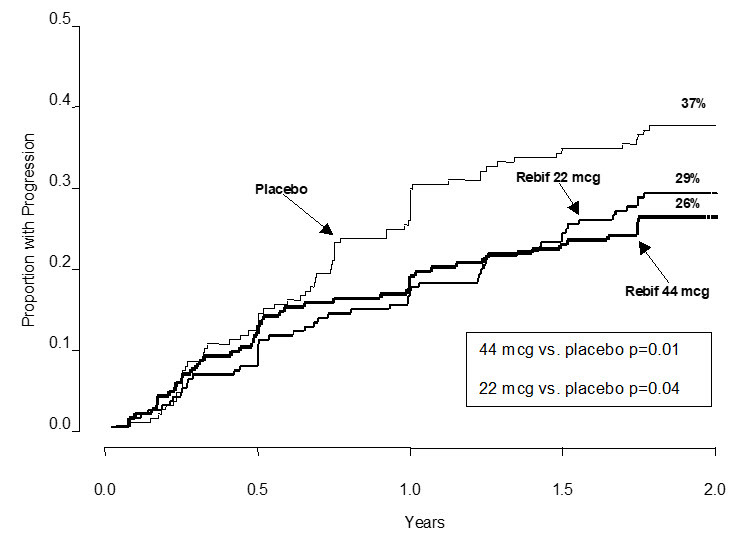 Study 1 was a 2-year placebo-controlled study in RRMS patients treated with REBIF 22 mcg (n=189), 44 mcg (n=184), or placebo (n=187). Table 3 enumerates adverse reactions and laboratory abnormalities that occurred at an incidence that was at least 2% more in either REBIF-treated group than was observed in the placebo group. Adverse reactions in Study 2, a 1-year active-controlled (vs. interferon beta-1a, 30 mcg once weekly intramuscular injection, n=338) study including 339 patients with MS treated with REBIF were generally similar to those in Study 1, taking into account the disparity in study durations. Anaphylaxis and other allergic reactions have been observed with the use of REBIF [see Warnings and Precautions (5.3)]. As with all therapeutic proteins, there is a potential for immunogenicity. In Study 1, the presence of neutralizing antibodies (NAb) to REBIF was determined by collecting and analyzing serum pre-study and at 6 month time intervals during the 2 years of the clinical trial. Serum NAb were detected in 59/189 (31%) and 45/184 (24%) of REBIF-treated patients at the 22 mcg and 44 mcg three times per week doses, respectively, at one or more times during the study. The data reflect the percentage of patients whose test results were considered positive for antibodies to REBIF using an antiviral cytopathic effect assay, and are highly dependent on the sensitivity and specificity of the assay. Additionally, the observed incidence of NAb positivity in an assay may be influenced by several factors including sample handling, timing of sample collection, concomitant medications and underlying disease. For these reasons, comparison of the incidence of antibodies to REBIF with the incidence of antibodies to other products may be misleading. The following adverse reactions have been identified during post-approval use of REBIF. Because these reactions are reported voluntarily from a population of uncertain size, it is not always possible to reliably estimate their frequency or establish a causal relationship to drug exposure. In a study in pregnant cynomolgus monkeys, interferon beta was administered daily (intramuscular doses approximately 1, 2, and 7 times the maximum recommended cumulative weekly human dose, based on body surface area) either throughout the period of organogenesis or later in pregnancy (gestation day 90 to term). No adverse effects on embryofetal development were observed; however, the possibility of adverse effects cannot be ruled out because of the small number of animals tested (six per dose group at each developmental period). It is not known whether REBIF is excreted in human milk. Because many drugs are excreted in human milk, caution should be exercised when REBIF is administered to a nursing woman. Clinical studies of REBIF did not include sufficient numbers of subjects aged 65 and over to determine whether they respond differently than younger subjects. In general, dose selection for an elderly patient should be cautious, usually starting at the low end of the dosing range, reflecting the greater frequency of decreased hepatic, renal or cardiac function, and of concomitant disease or other drug therapy. REBIF (interferon beta-1a) is a purified 166 amino acid glycoprotein with a molecular weight of approximately 22,500 daltons. It is produced by recombinant DNA technology using genetically engineered Chinese Hamster Ovary cells into which the human interferon beta gene has been introduced. The amino acid sequence of REBIF is identical to that of natural fibroblast derived human interferon beta. Natural interferon beta and interferon beta-1a (REBIF) are glycosylated with each containing a single N-linked complex carbohydrate moiety. Using a reference standard calibrated against the World Health Organization natural interferon beta standard (Second International Standard for Interferon, Human Fibroblast GB 23 902 531), REBIF has a specific activity of approximately 270 million international units (MIU) of antiviral activity per mg of interferon beta-1a determined specifically by an in vitro cytopathic effect bioassay using WISH cells and Vesicular Stomatitis virus. REBIF 8.8 mcg, 22 mcg and 44 mcg contains approximately 2.4 million international units, 6 million international units or 12 million international units, respectively, of antiviral activity using this method. 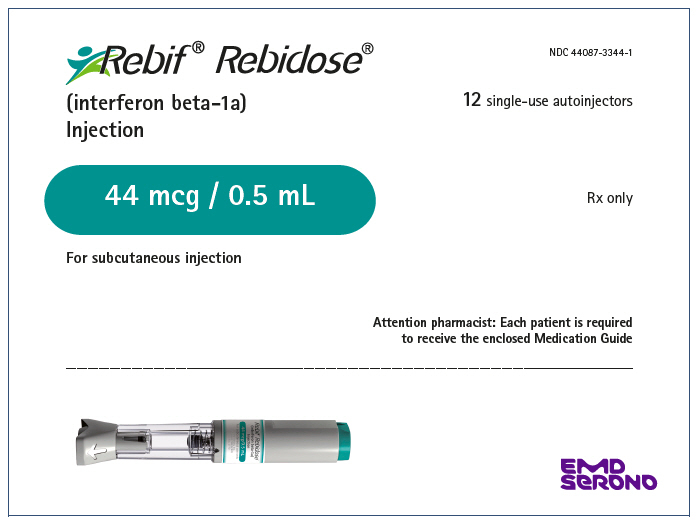 REBIF (interferon beta-1a) is formulated as a sterile solution in a prefilled syringe or REBIF Rebidose autoinjector intended for subcutaneous (sc) injection. Each 0.5 mL (0.5 cc) of REBIF contains either 22 mcg or 44 mcg of interferon beta-1a, 2 mg or 4 mg albumin (human), 27.3 mg mannitol, 0.4 mg sodium acetate, and water for injection. 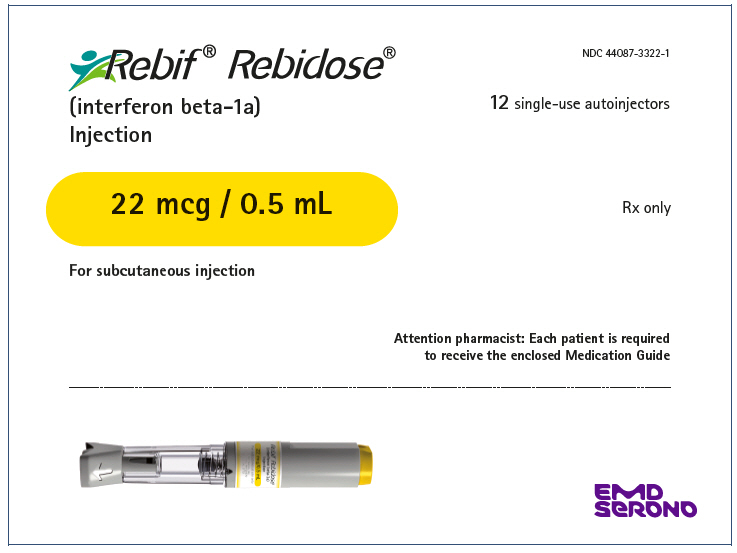 Each 0.2 mL (0.2 cc) of REBIF contains 8.8 mcg of interferon beta-1a, 0.8 mg albumin (human), 10.9 mg mannitol, 0.16 mg sodium acetate, and water for injection. The mechanism(s) by which REBIF (interferon beta-1a) exerts its therapeutic effects in patients with multiple sclerosis is unknown. The relationships between serum interferon beta-1a levels and measurable pharmacodynamic activities to the mechanism(s) by which REBIF exerts its effects in multiple sclerosis are unknown. No gender-related effects on pharmacodynamic parameters have been observed. The pharmacokinetics of REBIF (interferon beta-1a) in people with multiple sclerosis have not been evaluated. In healthy subjects, a single subcutaneous (sc) injection of 60 mcg of REBIF (liquid formulation) resulted in a peak serum concentration (Cmax) of 5.1 ± 1.7 IU/mL (mean ± SD), with a median time of peak serum concentration (Tmax) of 16 hours. The serum elimination half-life (t1/2) was 69 ± 37 hours, and the area under the serum concentration versus time curve (AUC) from zero to 96 hours was 294 ± 81 IU h/mL. Following every other day sc injections in healthy subjects, an increase in AUC of approximately 240% was observed, suggesting that accumulation of interferon beta-1a occurs after repeat administration. Total clearance is approximately 33-55 L/hour. There have been no observed gender-related effects on pharmacokinetic parameters. Pharmacokinetics of REBIF in pediatric and geriatric patients or patients with renal or hepatic insufficiency have not been established. Carcinogenesis: REBIF has not been tested for carcinogenic potential in animals. Mutagenesis: Interferon beta was negative in an in vitro bacterial reverse mutation (Ames) assay and an in vitro cytogenetic assay in human lymphocytes in the presence and absence of metabolic activation. Impairment of Fertility: In studies in normally cycling female cynomolgus monkeys given daily subcutaneous injections of interferon beta for six months at doses of up to 9 times the recommended weekly human dose (based on body surface area), no effects were observed on either menstrual cycling or serum estradiol levels. In male monkeys, the same doses of interferon beta had no demonstrable adverse effects on sperm count, motility, morphology, or function. Two multicenter studies evaluated the safety and efficacy of REBIF in patients with relapsing-remitting multiple sclerosis. Study 1 was a randomized, double-blind, placebo controlled study in patients with multiple sclerosis for at least one year, Kurtzke Expanded Disability Status Scale (EDSS) scores ranging from 0 to 5, and at least 2 acute exacerbations in the previous 2 years. Patients with secondary progressive multiple sclerosis were excluded from the study. 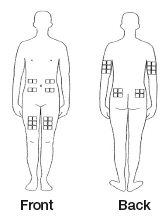 Patients received subcutaneous injections of either placebo (n = 187), REBIF 22 mcg (n = 189), or REBIF 44 mcg (n = 184) administered three times per week for two years. Doses of study agents were progressively increased to their target doses during the first 4 to 8 weeks for each patient in the study [see Dosage and Administration (2.1)]. The primary efficacy endpoint was the number of clinical exacerbations. Numerous secondary efficacy endpoints were also evaluated and included exacerbation-related parameters, effects of treatment on progression of disability and magnetic resonance imaging (MRI)-related parameters. Progression of disability was defined as an increase in the EDSS score of at least one point sustained for at least 3 months. Neurological examinations were completed every 3 months, during suspected exacerbations, and coincident with MRI scans. All patients underwent proton density T2-weighted (PD/T2) MRI scans at baseline and every 6 months. A subset of 198 patients underwent PD/T2 and T1-weighted gadolinium-enhanced (Gd)-MRI scans monthly for the first 9 months. Of the 560 patients enrolled, 533 (95%) provided 2 years of data and 502 (90%) received 2 years of study agent. Study results are shown in Table 4 and Figure 1. REBIF at doses of 22 mcg and 44 mcg administered three times per week significantly reduced the number of exacerbations per patient as compared to placebo. Differences between the 22 mcg and 44 mcg groups were not significant (p >0.05). The exact relationship between MRI findings and the clinical status of patients is unknown. Changes in lesion area often do not correlate with changes in disability progression. The prognostic significance of the MRI findings in these studies has not been evaluated. • Logistic regression adjusted for center. Patients lost to follow-up prior to an exacerbation were excluded from this analysis. (Analysis included 185, 183, and 184 patients for three times per week placebo, 22 mcg REBIF, and 44 mcg REBIF, respectively). • ANOVA on ranks adjusted for center. Patients with missing scans were excluded from this analysis. The time to onset of progression in disability sustained for three months was significantly longer in patients treated with REBIF than in placebo-treated patients. 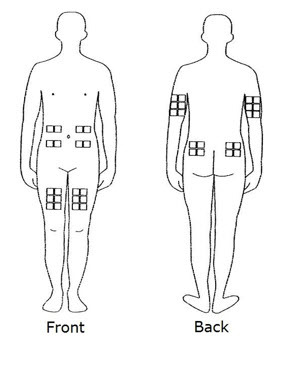 The Kaplan-Meier estimates of the proportions of patients with sustained disability are depicted in Figure 1. The safety and efficacy of treatment with REBIF beyond 2 years have not been established. Study 2 was a randomized, open-label, evaluator-blinded, active comparator study. Patients with relapsing-remitting multiple sclerosis with EDSS scores ranging from 0 to 5.5, and at least 2 exacerbations in the previous 2 years were eligible for inclusion. Patients with secondary progressive multiple sclerosis were excluded from the study. Patients were randomized to treatment with three times per week subcutaneous injections of REBIF 44 mcg (n=339) or once weekly intramuscular injections of 30 mcg AVONEX (n=338). Study duration was 48 weeks. The primary efficacy endpoint was the proportion of patients who remained exacerbation-free at 24 weeks. The principal secondary endpoint was the mean number per patient per scan of combined unique active MRI lesions through 24 weeks, defined as any lesion that was T1 active or T2 active. Neurological examinations were performed every three months by a neurologist blinded to treatment assignment. Patient visits were conducted monthly, and mid-month telephone contacts were made to inquire about potential exacerbations. If an exacerbation was suspected, the patient was evaluated with a neurological examination. MRI scans were performed monthly and analyzed in a treatment-blinded manner. Patients treated with REBIF 44 mcg three times per week were more likely to remain relapse-free at 24 and 48 weeks than were patients treated with AVONEX 30 mcg once per week (Table 5). This study does not support any conclusion regarding effects on the accumulation of physical disability. • Six REBIF Rebidose 8.8 mcg autoinjectors with lime-green injector buttons and Six REBIF Rebidose 22 mcg with yellow injector buttons. REBIF should be stored refrigerated between 36°F to 46°F (2°C to 8°C). DO NOT FREEZE. If needed, REBIF may be stored between 36°F to 77°F (2°C to 25°C) for up to 30 days and away from heat and light, but refrigeration is preferred. Do not use beyond the expiration date printed on packages. REBIF contains no preservatives. Each prefilled syringe and REBIF Rebidose autoinjector is intended for a single dose. Unused portions should be discarded. Inform patients of the availability of a Medication Guide, and instruct them to read the Medication Guide prior to taking REBIF. Instruct patients to take REBIF only as prescribed. Advise patients that depression, suicidal ideation, and suicide have been reported during the use of REBIF. Inform patients of the symptoms of depression and suicidal ideation and instruct patients to immediately report any of these symptoms to their healthcare provider [see Warnings and Precautions (5.1)]. Advise patients that severe liver injury, including hepatic failure, has been reported with the use of REBIF. Educate patients about the symptoms of hepatic injury and instruct patients to report them immediately to their healthcare provider [see Warnings and Precautions (5.2)]. Advise patients of the symptoms of allergic reactions and anaphylaxis, and instruct patients to seek immediate medical attention if these symptoms occur [see Warnings and Precautions (5.3)]. Advise patients that injection site reactions occur in most patients treated with REBIF and that injection site necrosis may occur [see Warnings and Precautions (5.4)]. Instruct patients to promptly report any break in the skin, which may be associated with blue-black discoloration, swelling, or drainage of fluid from the injection site, prior to continuing their REBIF therapy. To minimize the likelihood of injection site reactions, inform patients of the importance of rotating injection sites with each dose and the use of aseptic injection technique [see Dosage and Administration (2.2)]. Advise patients not to re-use needles or syringes and instruct patients on safe disposal procedures. Provide appropriate instruction for self-injection of REBIF and REBIF Rebidose, including careful review of the REBIF Medication Guide. Advise patients that they may develop a lowering of their peripheral blood counts, including their white blood counts, red blood counts, and platelets, and that their blood counts will be checked during therapy with REBIF. Inform patients that they may be more likely to get infections, anemia, or be at risk for bleeding, and that they should contact their healthcare provider if they develop symptoms of these adverse reactions [see Warnings and Precautions (5.5)]. Instruct patients to report seizures immediately to their healthcare provider [see Warnings and Precautions (5.7)]. Inform patients that flu-like symptoms are common following initiation of therapy with REBIF. Advise patients that concurrent use of analgesics and/or antipyretics may help reduce flu-like symptoms on treatment days [see Dosage and Administration (2.3)]. Advise patients that REBIF should not be used during pregnancy unless the potential benefit justifies the potential risk to the fetus [see Use in Specific Populations (8.1)]. Therefore, inform patients that if a pregnancy is considered, or does occur, the risks and benefits of continuing REBIF should be discussed with their healthcare provider. Read this Medication Guide before you start using REBIF and each time you get a refill. There may be new information. The information does not take the place of talking with your healthcare provider about your medical condition or your treatment. What is the most important information I should know about REBIF? During your treatment with REBIF you will need to see your healthcare provider regularly and have regular blood tests to check for side effects. REBIF is a prescription medicine used to treat adults with relapsing forms of multiple sclerosis (MS). It is a form of protein called beta interferon that is produced in the body. The way REBIF works in MS is not known. It is not known if REBIF is safe and effective in children. Who should not take REBIF? are allergic to interferon beta, human albumin, or any of the ingredients in REBIF. See the end of this Medication Guide for a complete list of ingredients in REBIF. What should I tell my healthcare provider before taking REBIF? REBIF and other medicines may affect each other causing side effects. See the Instructions for Use at the end of this Medication Guide on how to prepare and give an injection of REBIF using a prefilled syringe. For the REBIF Rebidose autoinjector, read the Instructions for Use that comes with the REBIF Rebidose autoinjector. Your healthcare provider should show you how to prepare and measure your dose of REBIF and how to inject your REBIF before you use it for the first time. REBIF is given by injection under the skin (subcutaneous injection) on the same 3 days a week, for example, Monday, Wednesday and Friday. Your injections should be at least 48 hours apart. Take them the same time each day. Inject REBIF exactly as your healthcare provider tells you. Your healthcare provider will tell you how much REBIF to inject, and may change the dose based on how your body responds. Do not inject more than your healthcare provider tells you to. Change (rotate) your injection site you choose with each injection. This will help decrease the chance that you will have an injection site reaction. Do not inject REBIF into an area of the body where the skin is irritated, reddened, bruised, infected or scarred in any way. Your healthcare provider will decide which is best for you. Always use a new, unopened, prefilled syringe of REBIF or REBIF Rebidose autoinjector for each injection. Do not reuse prefilled syringes or REBIF Rebidose autoinjectors. What are the possible side effects of REBIF? See "What is the most important information I should know about REBIF?" Blood problems. REBIF can affect your bone marrow and cause low red and white blood cell, and platelet counts. In some people, these blood cell counts may fall to dangerously low levels. If your blood cell counts become very low, you can get infections and problems with bleeding and bruising. Your healthcare provider may ask you to have regular blood tests to check for blood problems. How should I store REBIF? Store REBIF in the refrigerator between 36°F to 46°F (2°C to 8°C). If you cannot refrigerate your REBIF, you can store your REBIF at temperatures above 36°F and below 77°ËšF (2°C to 25°C) for up to 30 days. Keep REBIF away from heat and light. Keep REBIF and all medicines out of the reach of children. Medicines are sometimes prescribed for purposes other than those listed in a Medication Guide. Do not use REBIF for a condition for which it was not prescribed. Do not give REBIF to other people, even if they have they have the same symptoms that you have. It may harm them. This Medication Guide summarizes the most important information about REBIF. If you would like more information, talk with your healthcare provider. You may ask your healthcare provider or pharmacist for information about REBIF that is written for healthcare professionals. For more information, go to www.REBIF.com or call toll-free 1-877-447-3243. What are the ingredients in REBIF? Read and follow the Instructions for Use that come with your REBIF prefilled syringe before you start using it and each time you get a refill. Before you use a REBIF prefilled syringe for the first time, make sure your healthcare provider shows you the right way to use it. Important: For the REBIF Rebidose autoinjector, read the Instructions for Use that come with the REBIF Rebidose autoinjector. Parts of your REBIF Prefilled Syringe (See Figure A). puncture resistant safety container for disposal of used syringes. 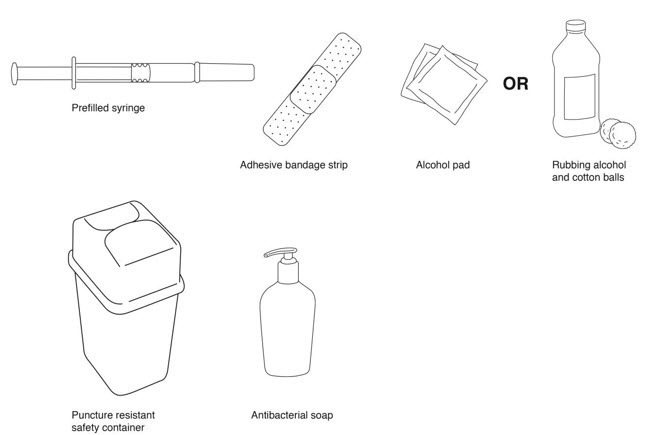 See "Disposing of your Needles and Syringes Section" in Step 4 of the IFU. an over-the-counter pain or fever reducing medicine, if your healthcare provider has recommended that you take this before, at the same time, or after you give yourself REBIF to help decrease the fever, chills, sweating and muscle aches (flu-like symptoms) that may happen. When first starting treatment with REBIF, your healthcare provider may prescribe either the 22 mcg or 44 mcg dose of REBIF. You should gradually increase the dose over 4 weeks, starting at 20% of the prescribed dose for the first 2 weeks, half-dose for the second 2 weeks (weeks 3 and 4), and then the full dose prescribed by your healthcare provider. If your prescribed dose is 22 mcg of REBIF, a REBIF Titration Pack containing 6 prefilled syringes with 8.8 mcg and 6 prefilled syringes with 22 mcg should be prescribed to you for use during the 4-week starting period. Table 1 explains the amount to inject using the REBIF Titration Pack syringes to gradually increase to 22 mcg. If your prescribed dose is 44 mcg, you may be prescribed either a REBIF Titration Pack (described above) or REBIF Rebidose Titration Pack containing 6 autoinjectors with 8.8 mcg and 6 autoinjectors with 22 mcg for use during the 4 week titration period. Table 2 explains the amount to inject using the REBIF Titration Pack or REBIF Rebidose Titration Pack to gradually increase to 44 mcg. Check the expiration date. Do not use if the medication is expired. The expiration date is printed on the syringe, plastic syringe packaging and carton. Remove your REBIF syringe from the refrigerator at least 30 minutes before you plan to use it so it can warm to room temperature. Do not heat or microwave the medication. Be sure that the dose, either, 8.8 mcg, 22 mcg or 44 mcg, described on the carton is the same as the dose prescribed by your healthcare provider. Remove the REBIF syringe from the plastic packaging. Keep the needle capped. Look at the contents of the syringe carefully. The liquid should be clear to slightly yellow. Do not use if the liquid is cloudy, discolored or contains particles. Use a different syringe. The best sites for giving yourself an injection are those areas with a layer of fat between the skin and muscle, like your thigh, the outer surface of your upper arm, your stomach or buttocks. Do not use the area near your waistline or within 2 inches of your navel. If you are very thin, use only the thigh or outer surface of the arm for injection. Use a different site each time you inject such as the thigh, hip, stomach or upper arm (See Figure C). Do not inject REBIF into an area of your body where the skin is irritated, reddened, bruised, infected or abnormal in any way. Wash your hands thoroughly with antibacterial soap before preparing to inject the medicine. Clean the injection site with an alcohol pad or cotton ball with rubbing alcohol using a circular motion. To avoid stinging, you should let your skin dry before you inject REBIF. Remove the needle cap from the syringe needle. If your healthcare provider has told you to use less than the full 0.5 mL dose, slowly push the plunger in until the amount of medicine left in the syringe is the amount healthcare provider told you to use. 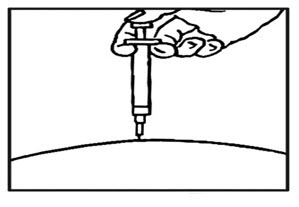 Use your thumb and forefinger to pinch a pad of skin surrounding the cleaned injection site (See Figure D). Hold the syringe like a pencil with your other hand. While still pinching the skin, quickly insert the needle like a dart at about a 90 degree angle (just under the skin) into the pad of tissue as shown (See Figure E). 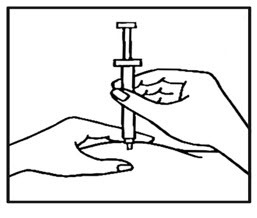 After the needle is in, remove the hand that you used to pinch your skin and inject the medicine using a slow, steady push on the plunger until all the medicine is injected and the syringe is empty (See Figure F). Withdraw the needle and apply gentle pressure to the injection site with a dry cotton ball or sterile gauze. Applying a cold compress or ice pack to the injection site after injection may help reduce local skin reactions. Keep a record of the date and location of each injection. After 2 hours, check the injection site for redness, swelling, or tenderness. If you have a skin reaction and it does not clear up in a few days, call your healthcare provider. Put your used needles, syringes, and autoinjectors, including REBIF, in an FDA-cleared sharps container right away after use. Do not throw away (dispose of) any syringes or autoinjectors in your household trash. When your sharps disposal container is almost full, you will need to follow your community guidelines for the right way to dispose of your sharps disposal container. There may be state or local laws about how you should throw away used autoinjectors and syringe needles. For more information about safe sharps disposal, and for specific information about sharps disposal in the state that you live in, go to the FDA's website at: http://www.fda.gov/safesharpsdisposal. This guide contains information on how to use Rebif® Rebidose®, a pre-assembled, single-use autoinjector that administers one dose of Rebif® (interferon beta-1a) for the treatment of relapsing forms of multiple sclerosis. Please read these instructions carefully before you start using the Rebif® Rebidose® and remember, you must have received the appropriate training before injecting. If at any time, you have questions or concerns, please contact your health care provider or call MS LifeLines at 1-877-447-3243. Always use the injection technique advised by your health care provider and contact them with any questions you might have. Always keep the Rebidose® autoinjector out of the reach of children. Do not share the Rebidose® with anyone. Doing so may result in injury, including the transmission of infectious blood-borne diseases. Adhere to strict safety and antiseptic precautions at all times. • Do not insert your fingers into the opening of the safety guard. • Do not try to re-use a Rebidose ® single-use autoinjector that has already been used. • Adhere to proper disposal procedures to avoid a needle stick injury. Check the expiration date on the Rebidose® autoinjector label and its carton. If the medication has expired, Do not use it. 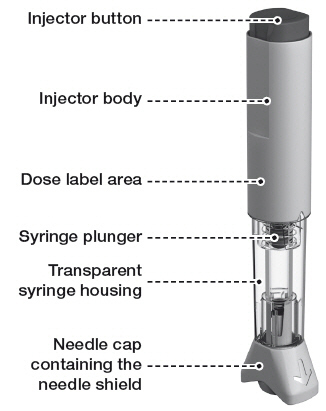 Examine the contents of the syringe carefully through the transparent housing. The liquid should be clear or slightly yellow. Inspect for cracks or breakage in the syringe or other parts. Do not use Rebidose® if it is cracked or broken or if the liquid is cloudy, discolored or contains particles. If the Rebidose® has been dropped more than 3 feet, or if it looks damaged for any reason, Do not use it. Instead, dispose of it in an acceptable biohazard (sharps) container and use a new Rebidose® autoinjector. Contact your health care provider about any damaged Rebidose® autoinjector. Store your Rebidose® autoinjectors in a refrigerator until ready for use. If you or someone around you is injured by the needle, contact your health care provider immediately and dispose of the Rebidose® in an acceptable biohazard (sharps) container. Injecting Rebif® the medicine in the Rebidose® autoinjector may cause skin reactions including soreness, redness, pain, bruising, or swelling. Tell your health care provider about any skin reactions that become swollen, painful, or look infected and do not heal within a few days. Use a different site each time you inject. Do not inject Rebif® where your skin is irritated, reddened, bruised, infected or abnormal in any way. The Rebidose® autoinjector contains a glass syringe. In very rare cases, the syringe may break during the injection. If this happens, immediately dispose of any broken glass and the damaged Rebidose® autoinjector in the biohazard (sharps) container, taking necessary precautions to avoid injury. Contact your health care provider or MS LifeLines at 1-877-447-3243 immediately. Rebidose® is available in 3 dose sizes. Check that the dose of Rebif® is the one prescribed for you by looking at the Rebidose® carton and at the dose label on the Rebidose® autoinjector. 6 Rebif® 8.8 mcg Rebidose® autoinjectors with a lime green injector button. 6 Rebif® 22 mcg Rebidose® autoinjectors with a yellow injector button. 12 Rebif® 22 mcg Rebidose® autoinjectors with a yellow injector button. 12 Rebif® 44 mcg Rebidose® autoinjectors with a teal green injector button. At the beginning of Rebif® treatment, your health care provider may prescribe a titration phase to gradually increase to the intended dosage. 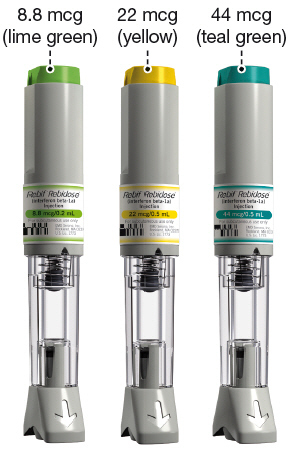 The Rebif® Titration Pack contains six 8.8 mcg Rebidose® autoinjectors with a lime green injector button and six 22 mcg Rebidose® autoinjectors with a yellow injector button. Weeks 1 and 2: Use one 8.8 mcg autoinjector three times a week, at least 48 hours apart. Weeks 3 and 4: Use one 22 mcg autoinjector three times a week, at least 48 hours apart. Your health care provider may provide a different dose and schedule. The best sites for giving a subcutaneous injection are those areas with a layer of fat between the skin and muscle. These include the thigh, the outer surface of the upper arm, the stomach and the buttocks. Do not use the area near your waistline or within 2 inches of your navel. Only choose one site for injection. Use a different site each time you inject. Do not inject Rebif® where your skin is irritated, reddened, bruised, infected or abnormal in any way. 1.1) Before you begin, you may find injecting more comfortable if you allow time for the Rebif® to warm up to room temperature before injecting. Therefore, it is recommended that you remove the Rebidose® autoinjector from the refrigerator at least 30 minutes prior to use. Do not heat or microwave a Rebidose® autoinjector. 1.3) Wash your hands thoroughly with antibacterial soap. 1.4) Open the tray over a table or soft surface by peeling back the plastic covering and remove 1 Rebidose® autoinjector. Do not remove the needle cap until you are ready to inject because the autoinjector could roll off the table and become unsterile. 1.5) Check the expiration date on the Rebidose® autoinjector label and its carton. If the medication has expired, do not use it. 1.6) Examine the contents of the syringe carefully through the transparent housing. The liquid should be clear or slightly yellow. 1.7) Inspect for cracks or breakage in the syringe or other parts. Do not use Rebidose® if it is cracked or broken or if the liquid is cloudy, discolored or contains particles. 1.8) Use an alcohol wipe to clean the injection site. Let your skin dry to prevent stinging during injection. 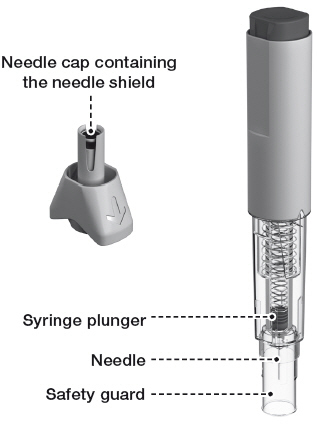 1.9) Hold the Rebidose® by the injector body (fig a ) and pull off the needle cap. 1.10) Look inside the needle cap to make sure you see a black needle shield inside the cap (fig b ). 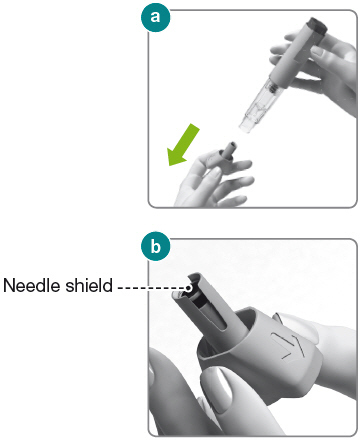 1.11) Dispose of the needle cap and proceed to the injection step without delay. 2.1) Hold the Rebidose® autoinjector in your palm with your thumb above the injector button. 2.2) Place the Rebidose® upright with the needle end flat against your skin at a 90° angle. 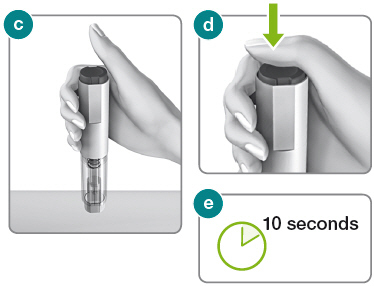 Push the Rebidose® against your skin until you feel resistance; this action unlocks the injector button (fig c ). 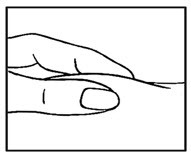 2.3) Keep the Rebidose® pressed firmly against the skin and use your thumb to push the injector button (fig d ). You will hear a click, which means the injection has begun. 2.4) Keep the Rebidose® pressed firmly against your skin for at least 10 seconds while the medication is dispensed (fig e ). If you have any problems, contact MS LifeLines at 1-877-447-3243. If the injection does not start, release the injector button and make sure that the Rebidose® is still pressed firmly against your skin. Then push firmly on the injector button, listening for the click that indicates the start of the injection. 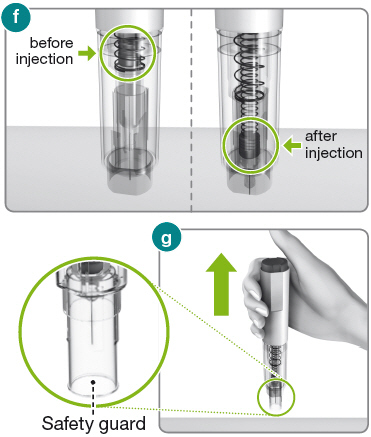 3.1) Before lifting the Rebidose® from your skin, make sure that the syringe plunger has moved to the bottom and that the entire dose has been injected (fig f ). 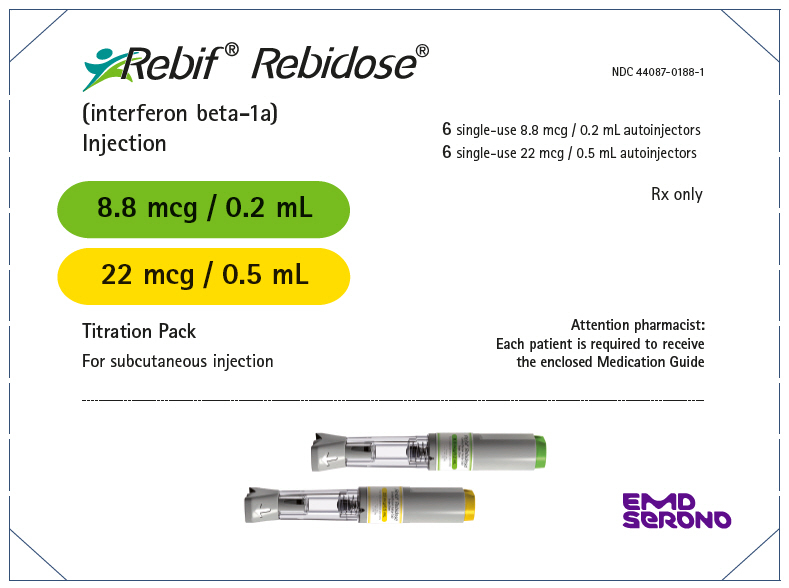 3.2) Lift the Rebidose® from the injection site. The safety guard slides down and locks into place to protect you from the needle (fig g ). If any liquid is left in the syringe or if you have any other problems, contact your health care provider or MS LifeLines at 1-877-447-3243. Do not try to put the needle cap on the used Rebidose® autoinjector. It is no longer needed. 3.3) If desired, use a small adhesive bandage to cover the injection site. 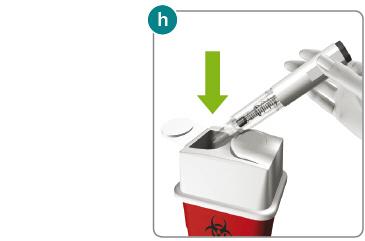 1) Put your used Rebidose® autoinjectors in a FDA-cleared sharps disposal container right away after use (fig h ). Do not throw them away (dispose of) in your household trash. • properly labeled to warn of hazardous waste inside the container. 4) Do not dispose of your used sharps disposal container in your household trash unless your community guidelines permit this. Do not recycle your used sharps disposal container. Always keep the biohazard (sharps) container out of the sight and reach of children. Do not insert your fingers into the opening of the safety guard. Do not try to re-use a Rebidose® single-use autoinjector that has already been used. Adhere to proper disposal procedures to avoid a needle stick injury. 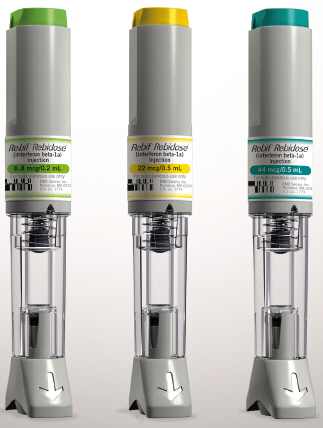 Each Rebidose® autoinjector contains a single dose of Rebif®. Store Rebidose® autoinjectors in the refrigerator between 36°F and 46°F (2°C to 8°C). Do not freeze. If a refrigerator is not available, Rebidose® may be stored between 36ËšF and 77ËšF (2ËšC to 25ËšC) for up to 30 days away from heat and light. Do not put them in or near the freezer compartment. Do not inject Rebif® that you know or suspect has been frozen. Keep the Rebidose® in its packaging and only open one when you need it. Refer to the Rebif® drug package insert and medication guide for specific storage guidelines. When you travel, take 3 Rebidose® autoinjectors with you for each week of your trip. Take some extra in case you are away for longer than expected. Remember to pack an empty biohazard (sharps) container for proper disposal. When traveling by air, always carry Rebidose® autoinjectors in your hand luggage because the aircraft luggage compartment can be very cold and the Rebif® could freeze. It is safe to pass Rebidose® autoinjectors through x-ray machines, but you may need a note from your health care provider to allow you to carry them aboard an airplane. Prior to traveling, always check with your airline and your health care provider about bringing injectable medication with you. You may find it helpful to record information about your 3 weekly injections (Inj.) to discuss with your health care provider. This Instructions for Use has been approved by the Food and Drug Administration.